After doing so well last year, the Frogs have a lot of pressure on them to make it to the playoffs at the end of the 2015 football season. They were able to start strong with a 4-0 record, beating teams like the SMU Mustangs and Texas Tech Red Raiders, but the Frogs have learned across all varsity sports that the University of Texas is one school that tends to do the unthinkable. Not only did TCU need to remain undefeated after the UT game, they needed to win big because it was their Homecoming Game. There is not a single collegiate football team that would want to lose this stadium-packed game. On the flip side, UT needed the win. After two really rough weeks, they had to have a win to boost the morale of the team and fans. Two of the three losses for the Horns were due to special teams errors, so this game needed to be the platform in which special teams showed their worth. I was once told that special teams never looks good; they either do their job or look bad. They are expected to not mess up, so they don’t have much of a chance to get praised for doing the expected. The Frogs and Longhorns have been in and out of each other’s conferences for over one-hundred years. (Both teams are now in the Big 12 conference.) The majority of the time UT has come out on top as they have a 62-22-1 lead on TCU; however, the tables could have started to turn last year because TCU came out on top over UT with a 48-10 win. Either TCU is going to have a two-win “streak” for the first time since 1958-59 or UT will put the Frogs back in their place after the October 3, 2015 game at Amon G. Carter Stadium. The day of the game arrived, and the atmosphere in Fort Worth could not have been better. Orange, Purple, and White was everywhere; yards became parking lots; Frog Alley was buzzing with excitement; and the stadium was filling up. Homecoming activities were in full swing as alumni-filled tailgates reminisced on their glory years and tents filled with past and present Greek members connected. Everyone, including the players, felt the importance of the game in the air. It was time to play (and watch) some good Texas football. The Frogs kicked off the 1st quarter with a bang by putting up 30 points on the Horns. At this pace, TCU would have outscored UT 120-0; however, the Longhorn defense kicked it into high gear during quarter 2 and limited TCU to one touchdown in the last minute of the half. Out of the tunnel came the Frogs ready to send the Horns back to Austin. This half was a little slower for TCU as Coach Gary Patterson slowly replaced the starters with 2nd and 3rd-string players. Surprisingly, TCU’s kicker, Jaden Oberkrom, had the opportunity to kick 2 field goals in the half. Texas quarterback, Tyrone Swoopes, also put up six points on the board after completing a 21 yard pass to Lorenzo Joe with 5:14 left in the game. Their kicker, Nick Rose, finally got the ball through the uprights for an extra-point after missing two field goals earlier in the game. The final score ended up being 50-7 in favor of the Horned Frogs. They also added a win to their history which makes the historical record now 62-23-1. 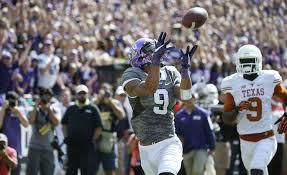 TCU now has a two-win streak against UT, and they moved to 5-0 for the season. This win meant the Homecoming festivities could stay cheery, and Frog fans needed to keep an eye on the AP Rankings because they were likely to jump a few spots. Lucky for the Horned Frogs, that is exactly what happened. TCU is currently ranked number two in the country. 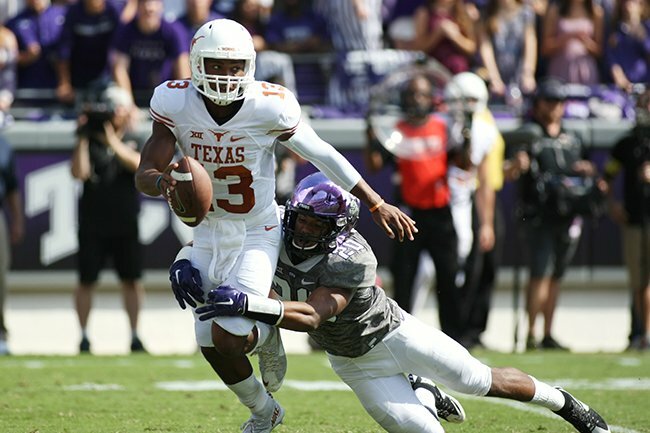 While the game ended well for the Frogs, the Horns had a long drive back to Austin. Texas now has a record of 1-4. 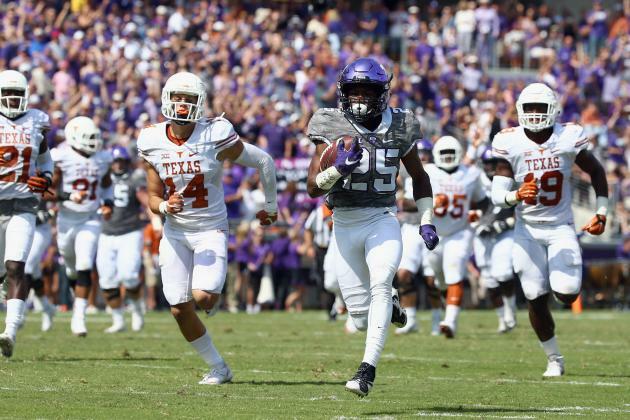 The Longhorns special teams are failing to do their job, the offensive coordinators cannot decide on a quarterback, and the defense did not do near as well as the analyst’s thought against the Frogs. Tomorrow, TCU takes on Kansas State in Manhattan, Kansas at 6:30 p.m., and UT takes on OU in Dallas, Texas at 11 a.m.